Opening a file is a must if you want to get any work done, and opening a file in any application in Windows XP is a cinch. If you figure out how to open files in one application in Windows XP, you can open files in any application. So check out the following steps so that you can easily open files in any application in Windows XP. After you have an application running, choose File from the Menu bar to click Open. Select the location of the file. 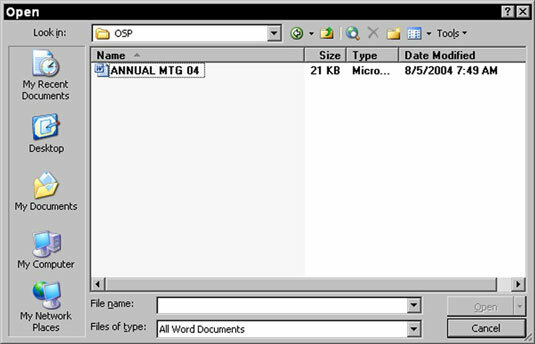 You can select the file’s location by using the Look In drop-down list or by clicking an icon on the left side of the dialog box to view categories, such as My Documents, My Computer, or Desktop. Still can’t find the file you want to open? With the Open dialog box displayed, click the Tools button and select Search. A File Search dialog box appears, putting both basic and advanced search tools at your fingertips. If you double-click a folder in the list that appears, the folder opens to show files contained within the folder. Select the file that you want to open, and then click the Open button. If you want to look only for files of a certain type, select that type in the Files of Type drop-down list in the Open dialog box. Doing so restricts the list to the types of files that the application can open. If you need more information about a file to be sure that it’s the one you want to open, such as the date you last saved it, click the arrow on the View icon near the upper-right corner in the Open dialog box and select the Details view. This displays the filename, size, format, and date last modified.